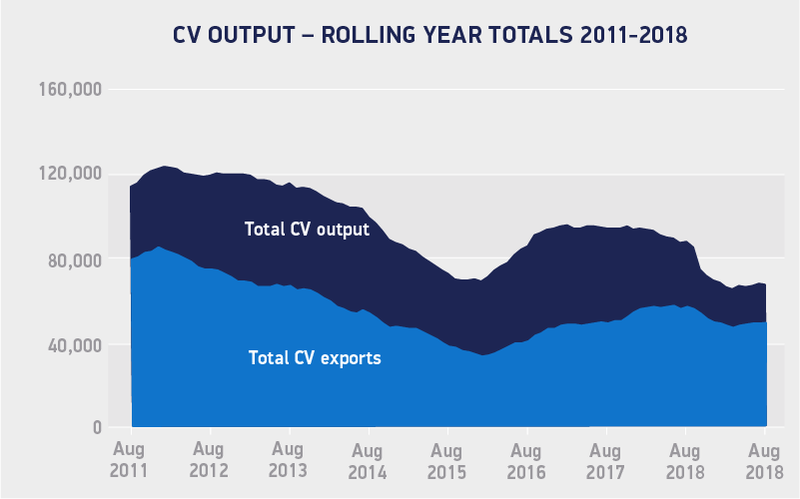 UK CV manufacturing falls -1.6% in August, with 3,685 units rolling off production lines. Output declines for both home and overseas markets, down -3.4% and -0.2% respectively. 52,478 vans, trucks and buses produced so far this year, down -2.9% on 2017. UK commercial vehicle (CV) manufacturing declined moderately in August, according to figures published today by the Society of Motor Manufacturers and Traders (SMMT). 3,685 vans, trucks, buses and coaches were built in Britain last month, a -1.6% fall year on year, representing 59 fewer vehicles. Production for the UK declined -3.4% in the month, while export demand fell by just four units. In the year-to-date, commercial vehicle manufacturing is down -2.9%, impacted by a -12.7% drop in production for the home market, where business uncertainty and fluctuating buying cycles have influenced demand. Overall, output continues to be driven by exports, up 3.1% compared with the first eight months of 2017. More than 52,000 CVs have been built in Britain so far this year, with 65.9% destined for overseas customers. August is typically a low-volume month for CV production so drawing conclusions from snapshot comparisons is not advised, especially considering the impact large fleet orders can have. With fluctuating buying cycles and business uncertainty continuing to affect the UK market, todayâÂÂs figures once again underline our reliance on international trade âÂÂ particularly with the EU. Therefore, it is imperative we maintain our beneficial trading arrangements with the EU and other key markets.